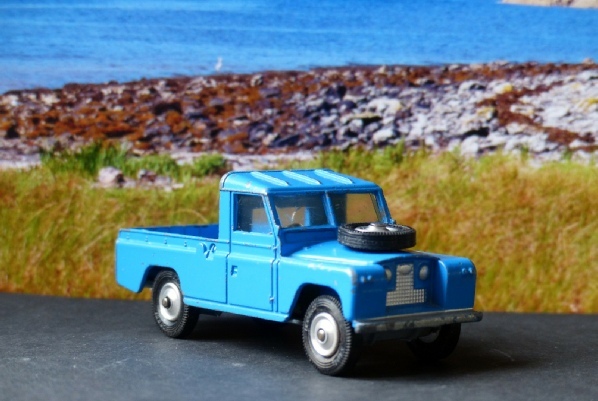 The blue Land Rover was not released as an individual item but with a white canopy as part of Gift Set 15, towing the new horse box in matching blue. The canopy or, sometimes, the side panels should have Pony Club stickers. Good replacements are easy to apply if you can find them. This colour is quite scarce with normal wheels. Most had cast, spoke effect wheels which matched those on the horse box. These were then replaced by Whizzwheels as this is one of the models that spanned their introduction. This is in very good condition with juts a few small chips. It has a grey plastic hook.